In this very spot, at the heart of a 3-million metropolis, overlooking the beautiful lagoon and near the seaside, beats the heart of Salvador’s football. The old Estadio Fonte Nova was erected here and had games with over 100,000 spectators in its heyday. Even when local clubs where underperforming, the crowds were impressive. One of such cases was the promotion game of SC Bahia in 2007. With over 59,900 people in attendance, this is still the global record for any game of the third league. But with the great record comes a tragedy. Sold out stadium’s structure couldn’t fully endure the crowd and one step broke, making 7 people fall onto the pavement outside to their death. After that devastating event the old Fonte Nova was closed, standing like a ghost until mid-2010 when demolition crews came in. Salvador was shortlisted to hold the 2014 World Cup and a new stadium was designed to replace Fonte Nova. Construction works began in September 2010 and lasted until April 2013, long before FIFA’s deadline for Brazilian stadiums. The name Fonte Nova, meaning literally The New Source, was retained for the new 55,000-capacity stadium designed by Schulitz+Partner. For the German office it was the second World Cup venue after their Hannover AWD Arena. Though the capacity was set slightly lower than at the previous stadium, three tiers came instead of two to bring fans closer to the action. Outside the stadium changed completely. Old concrete giant was replaced by white, seemingly light structure with horizontal blinds and thin membrane roof. A lot changed and no wonder – from an outdated stadium this had to changed to top-notch World Cup venue, able to operate in commercial event market after the FIFA tournament. Then again, not only the name was kept. South side of the stadium is open with no regular seating and blue seats make the new stadium indeed remain the symbolic ‘new source’ for nearby lagoon waters. The open south end turned out to become a great asset of the stadium. Since the opening in April 2013 the covered open space played host to numerous events, from fashion shows, through conferences to sports events and concerts. All without challenging the pitch’s quality. Quite rightly, because the field needs to stay fresh for EC Bahia, largest local club, who became the anchor tenant. And though 55,000 is well above the average reached for league games, the stadium seems to get good use of its facilities. 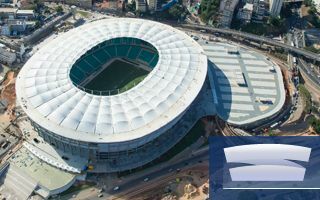 It also started recovering part of the invested public funds, because in 2013 it became the first 2014 World Cup stadium to reach a naming rights deal with beer brand Itaipava. The contract is worth $100 million over a decade, representing almost 40% of the stadium’s cost. Fonte Nova may be the heart of football in Bahia’s Salvador, but will its gentle aesthetics persuade you into voting for it? Remember, we’re waiting for your Stadium of the Year voice until (and including) Feb 22!